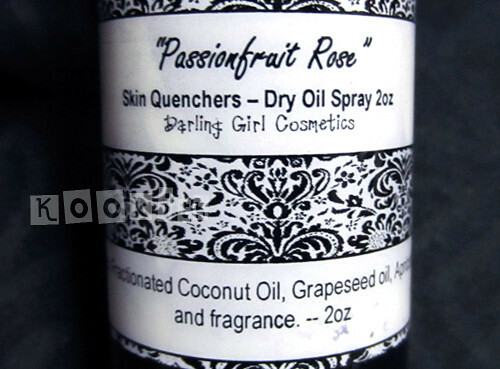 A dry oil spray for the skin. Dry oil sprays are so quick and easy to use and leave your skin silky smooth in one easy step. I find the best time to apply these is right after bathing to lock the moisture in, of course you can use these whenever your skin needs a drink. Just spritz on and give a light rub for smooth lightly scented skin. These are made with light carrier oils that soak into the skin quickly. Darling Girl are different because we do not use silicones in ours like many other companies use. We use Grapeseed oil which is so awesome for dry skin, Apricot Kernel Oil another great oil for dry skin and Fractionated Coconut oil which is the lightest of all carrier oils and gives these such a light and airy feel. As far as first impressions go, I like the high quality vintage label used. 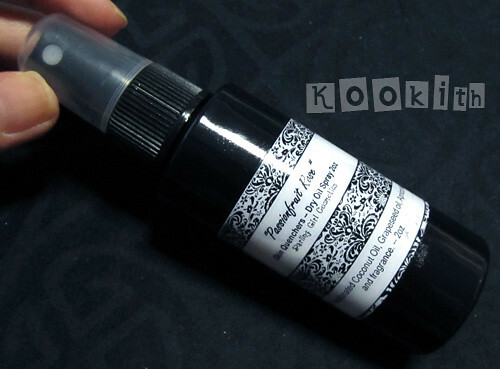 The label is waterproof, which is really important because the bottle tends to get quite oily after some time. After handling the bottle with my oily hands for a few months now, the words on the label have not rubbed off, nor has the label peeled off. Despite living in a climate with high humidity, I have very dry skin from spending most of my time in an air-conditioned environment, and I find that the dry oil spray leaves my skin feeling moisturised and silky smooth. When I first sprayed it on, the Skin Quencher seemed quite oily because it was literally a puddle of oil coming out of the nozzle, but after a light rub, it sunk in quickly and did not leave a greasy layer on my skin. The passionfruit rose scent smells amaaaaazing. The passionfruit and rose combination works really well together, and I like that it is strong and sweet. After applying this product, I do not need to apply perfume as the fragrance is long-lasting. I don’t think this is for people who are sensitive to smells though. I can only use this when my husband isn’t home, because he finds the scent overpowering. I must say that while I like the aesthetics of the packaging (the black bottle with the spray nozzle looks rather classy), it leaves much to be desired in terms of usability. When I spray the oil on my body, I have to work quickly because the oil will start to stream downwards. At some point, I have to switch the bottle to the oily hand in order to moisturise the other side of my body. I do understand the concept behind the spray bottle, and it does make sense – spray and rub. However, it’s not that easy to hold a slim and smooth bottle with an oily hand, while trying to press down the nozzle with an equally oily index finger! To be fair though, oil is a difficult liquid to package properly. Even the Johnson & Johnson baby oil bottles are terrible, with oil running down the sides. Perhaps a pump bottle or a bottle with a pointed mouth would dispense the product better than a spray nozzle? I will definitely repurchase the Skin Quencher despite my views on the packaging. I like the texture of the oil, and I like how it makes my skin feel. Shopping at DG is always a pleasure, and Susan’s customer service is fantastic.